We visit some superb garden and pass through some of Scotland’s most spectacular countryside with mountains, lush lowlands and scenic coastlines. All the gardens are privately owned with a surprising collection of plants growing on the north west coast in Wester Ross warmed by the Gulf Stream. Wonderful gardens are to be found on the colder north east coast. The gardens and countryside are stunning at the beginning of September, an ideal time to visit. A beautiful luxurious 18C country house at Novar is our first base. Situated in the scenic Highlands near Evanton in Ross-shire it is surrounded by a country estate with extensive woodlands and farmland. We continue to the delightful Culloden House Hotel near Inverness, a fine Georgian mansion designed by Robert Adam. It has a four acre walled garden recently restored with interesting plantings. The house lodged Bonny Prince Charlie prior to the fateful battle of Culloden Moor. You will be accompanied by Paddy Scott as tour leader. Paddy has a long involvement in the promotion of Scottish gardens. Meet at Inverness train station early afternoon for a short transfer to a luxurious private country house on the Novar Estate in Ross-shire, our base for three nights. We visit the beautiful walled garden recently replanted which is surrounded by breathtaking sweeping parkland. Early evening aperitif and short talk on the programme before enjoying dinner together. Morning visit to Dunbeath Castle situated on the cliff tops overlooking the North Sea. A remarkable garden reputed to be the best designed walled garden in Scotland. Lunch at a restaurant in Dunbeath. We continue to neighbouring Langwell with its magnificent herbaceous border and garden rooms all in a large walled garden set in the secluded Langwell Strath. Return to Novar House where we will be hosted for dinner by the owners, Mr and Mrs Munro Ferguson. 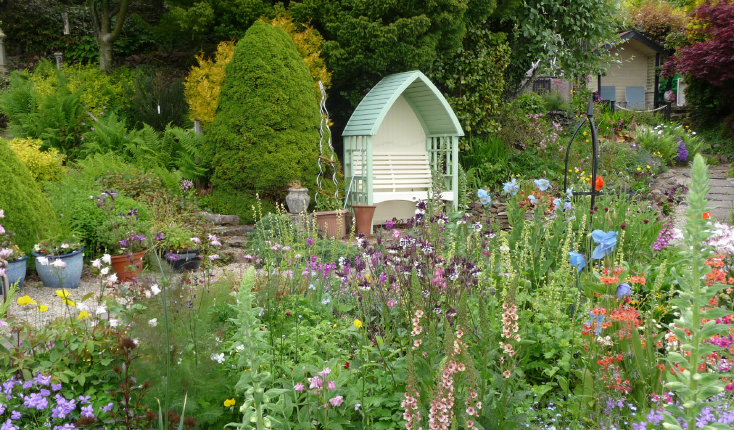 We leave for an award winning coastal garden on the edge of the Moray Firth. The Lockout at Kilmuir is a pretty cottage garden planted on a steep slope. We then proceed to House of Aigas situated in the beautiful valley of the river Beauly. The grounds have some superb trees and woodland and an informal garden with herbaceous borders. We enjoy lunch in the house. The gardens of Old Allangrange are where the designer owner has done much to create a fascinating garden with sculptured hedges and a backdrop of the 17C lime washed house. Return to Novar House. A full day on the west coast. We travel through wild countryside to our first visit. Dundonnell House on Little Loch Broom with its magical garden consisting of various themed ‘rooms’ around an ancient yew trees. Durnamuck, on the edge of Little Loch Broom is a plantsman’s paradise with a rich range of herbaceous borders, drystone wall plantings, South African and Mediterranean plants have been collected from all over the world. After lunch, we continue through scenic mountainous and coastal countryside to the garden of The House of Gruinard with its stunning estuary location. Fine herbaceous and shrub borders with a very good water garden. 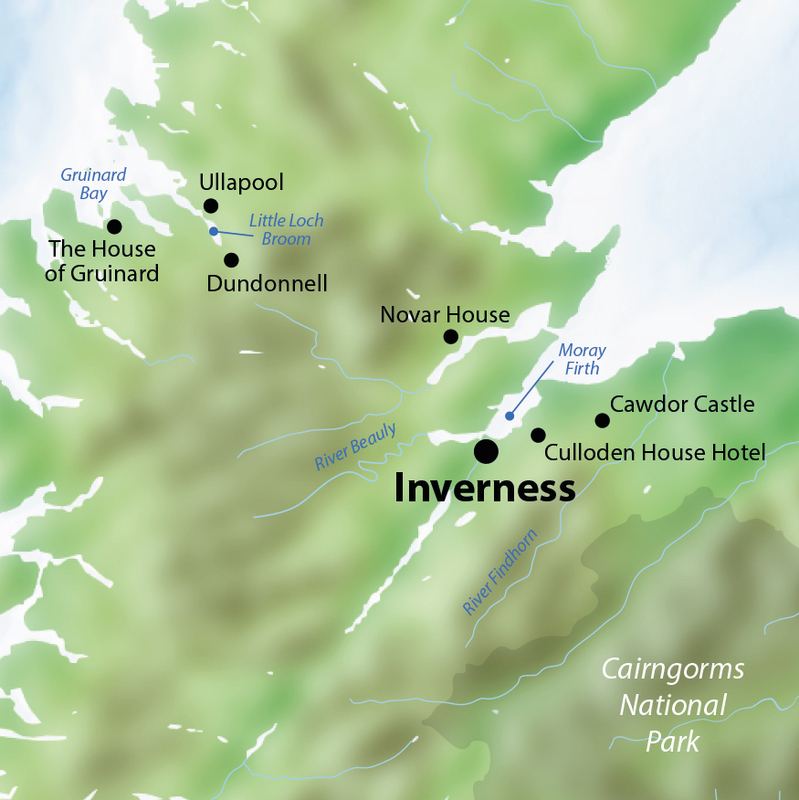 We return eastwards towards Inverness and check in to Culloden House Hotel. Dinner together in the hotel restaurant. 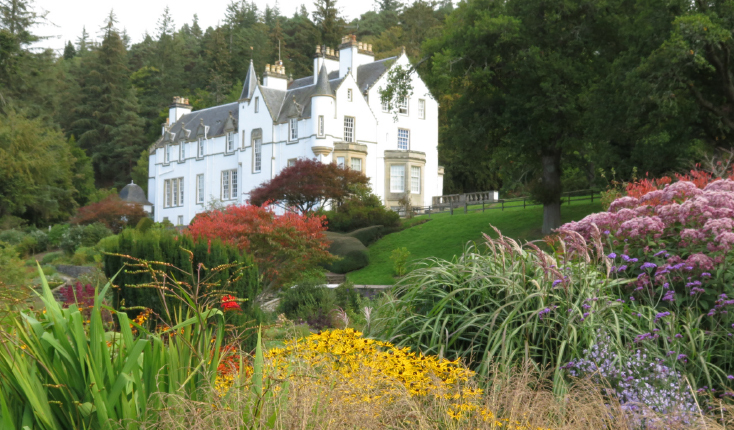 Today we visit some splendid gardens along the Moray Firth. Logie House has an extensive garden and grounds overlooking the River Findhorn. A well planted garden alongside a meandering burn which has been completely re-designed recently and is superb. We then proceed to Boath House restored by the current garden designer owner in the contemporary style of Piet Oudolf. A walled garden leads to an ornamental lake and a bog garden. We enjoy lunch in the house. Our final visit is to Cawdor Castle, home to the Earls of Cawdor set in wonderful grounds with its excellent walled garden and woodland. We return to Culloden House for dinner on the final evening. We depart with luggage for a morning visit to Glenkyllachy Lodge at Tomatin followed by a light lunch in the house. You will be taken to Inverness station or the airport for afternoon departures. Transport in modern comfortable minibus, excellent accommodation with ensuite bathroom, all meals included and alcoholic drinks at Novar, garden visits, tips, accompanied by Paddy Scott, an excellent guide. 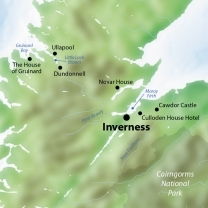 Alcoholic and soft drinks at Culloden House, items of a personal nature, tips, items of a personal nature, Full cover of fully comprehensive travel insurance, travel to/from Inverness. The climate in early September should be sunny and pleasantly warm though heavy rain showers can occur. Layers are recommended and good shoes for the garden visits. Smart casual for the evening. Some extensive gardens and some steep paths and terraces. Reasonably ability to walk through a garden for a couple of hours with an owner or head gardener.